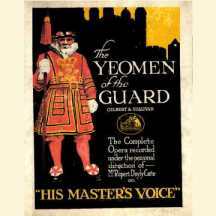 In 1917, HMV began a series of G&S recordings "under the direction of Rupert D'Oyly Carte," but maintained its long-standing policy of using its own stable of recording artists rather than D'Oyly Carte singers. Over time, this policy came to be seen as outmoded, particularly given the rival Columbia Company's policy of issuing records "of theatrical musical productions by the artists whose names are associated with the theatres themselves." Bowing to the pressure, HMV ordered test pressings of four D'Oyly Carte singers: Henry Lytton, Leo Sheffield, Derek Oldham and Bertha Lewis. 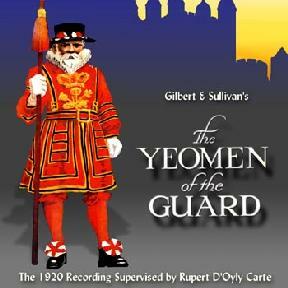 Incredibly, HMV management concluded that only Oldham "would be of any use in forming the [recorded] cast of the Gilbert and Sullivan operas." Baker sings the Act I finale; Dawson sings the rest of the role. Walker sings "When maiden loves," "Were I thy bride," part of the Act I finale and "A man who would woo a fair maid"; Heyl sings "Alas, I waver to and fro," part of the Act I finale, "When a wooer goes a-wooing" and the Act II finale. Dawson sings "Tower warders"; Radford sings "Didst thou not, oh, Leonard Meryll". After hearing the records, Rupert D'Oyly Carte had two significant objections. He found Ruby Heyl's Phoebe "quite unsuitable," observing that "Her voice is far too heavy and mature in quality." He also found George Baker too robust a jester, observing that, in the Act II finale, he "[did] not convey in the least that the man was on the point of collapse." Owing to these objections, three more sessions were scheduled. All of Phoebe's significant solo music was re-recorded, with Nellie Walker replacing Ruby Heyl (although Heyl's parts in the concerted numbers were allowed to remain in the set). And, the end of Act II was re-recorded for Baker to become more broken-hearted. The details of the recording sessions are presented in the "Recording Sessions" table, below. The casting of the Lieutenant presents some confusion. From the record labels, one would conclude that Radford sings the role throughout Act I and Halland throughout Act II. However, this arrangement would have Radford singing "Astounding news, the prisoner fled..." and then answering himself with Shadbolt's line, "My lord, I did not set him free." It seems more likely that Halland sang the Lieutenant in the Act I finale (he was clearly present during the recording session), although it is difficult to tell from listening to the side. 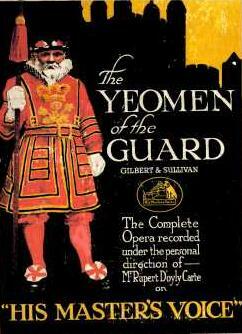 Derek Oldham sang Fairfax again on the 1928 Yeomen, which also has the advantage of being an electrical set and having D'Oyly Carte performers in most of the roles. However, for those with a taste for vintage recordings, Chris Webster "Sounds on CD" and 78s 2 CD have each issued the recording on CD at an extremely reasonable price. For all of these, Chris Webster, Michael Walters, James Lockwood, and other correspondents have verified the existence of multiple published takes. Substantial excerpts from this recording were included on Pearl GEM 125, a Derek Oldham retrospective disc. Sides 20 & 22 were included on Arabesque's LP reissue of the 1931 Ruddigore. The table above presents both the published sides and the rejected takes in the order recorded. The identification of the artists on each side and the details of the rejected takes were supplied by Chris Webster, who in turn obtained transcriptions of the original HMV artist sheets from his colleague, Alan Kelly. In the table, the "result" column indicates whether a matrix was issued or rejected. If a matrix was rejected, then the entire row is printed in italics. For issued sides, the published matrix numbers are underlined. For example, the designation "HO4282-1-2" (see the first row, below) indicates that there were two takes for matrix HO4282, of which the first was published. Francis gives the date of Session Four as 26 May 1920. Chris Webster, who has seen two different transcriptions of the artist sheets, confirms that the date was 27th May. On 18th June 1920, an ensemble called the Mayfair Orchestra recorded a single unpublished take for the Instrumental Selection, mat. HO4443. There were two more takes on 6th July (HO4461-1-2), the first being the published take. These are not shown in the table above. The artist sheets for the 6th July session mistakenly describe the selection as part two of the overture, which it is not. On matrix 4398, the HMV artist sheets do not include Edward Halland, but someone called W.&Clarke instead. This is the only mention of W.&Clarke anywhere for this recording, and as Halland participated in all the other sides recorded during this session, the mention of Clarke may very well be a mistake. On matrix 4401, the HMV artist sheets do not list the chorus. The men likely would have included all of those present at the session, viz., Baker, Pike, Radford, Glynne and Halland. The women would certainly have included Heyl, B.&Jones, Thornton, and possibly Walker and S. Jones.